One of the advantages of binary options trading is that expiry time can be very low. The narrower the expiry time limit is used, the faster the profit can be obtained by the trader. This facility is certainly good news for short-term traders, especially scalpers who like to open several trading positions in a day. In ordinary forex trading, short-term traders only get a little profit for each of their trading positions, where the opportunity to increase profits is only by opening as many trading positions as possible so that the profit from each position can meet the daily profit target. In contrast to spot forex, binary options allow short-term traders to achieve large return profits even though the duration of trading only takes place in minutes. This can happen because traders can choose their own profit percentage and amount of capital. The percentage of profit and the amount of capital can be arranged in such a way as to limit losses or maximize profit opportunities. Therefore, it is not surprising that binary options are a favorite place for short-term traders. Each binary options broker has a different minimum expiry time limit. There are those who provide expiry time of 1 minute, some even allow trading positions to take place in just seconds. Although trading is only done for a short time, it does not mean that this method is done without strategy. There are many binary options trading strategies based on the types of time frames, one of which is a 5 minute strategy. The 5 minute trading strategy in binary options is one of the best and simplest high-frequency strategies. The main idea of ​​using this strategy is to open trading positions on market conditions that allow for short-term reversals. This method is easy to learn for those of you who are new to binary options, because it can make it easier for you to do analysis, both technically and fundamentally. For starters, you can use charts with a time frame between 1-5 minutes, with an expiry limit of 5 minutes. Very simple and easy to understand for beginners. Makes it easier for beginner traders to learn the basics of technical and fundamental analysis. Very suitable for forex binary options. Produce good trading opportunities, with a success percentage of up to 72%. Only involves a few techniques and trading rules. Allows traders to open up to more than 20 trading positions for 1 currency pair in a day. Trading risk can be minimized by adjusting the amount of capital for each option position. As with forex spots, binary options trading with news trading bases the placement of options on economic news from countries related to the currency pair traded. To be able to analyze price movements fundamentally, many traders use the economic calendar to find out when economic news releases have a major impact on the value of a particular currency. Usually, large influential data will be marked by 3 stars or 3 bulls, depending on the economic site that provides the calendar. Usually, forecasts on economic calendars can make it easier for you to open trading positions at the beginning of the trend. But if you only use expiry time 5 minutes, it's good if you wait until the data has actually been released, because there are likely to be different results than expectations. For example, the US NFP, which is one of the most important fundamental data for the USD, achieved worse-than-expected results. You can immediately place the "put" option for USD / JPY or choose the "call" option for EUR / USD or GBP / USD as soon as the results are released, placing an expiry time of 5 minutes. Do not open a trading position. Placing a "call" option for currency pairs whose base currency is affected by the news. (Example: take the "call" option for EUR / USD after Eurozone inflation data shows better-than-expected results). Select the "put" option for the currency pair whose quote currency is affected by the news release. (Example: choose the "put" option for USD / JPY shortly after Japanese GDP data is reported to reap better than expected gains). Selecting the "put" option for currency pairs for which the base currency is affected by economic data. (Example: choose the "put" option for GBP / USD after the BOE decides to cut the benchmark interest rate lower than expected). Place a "call" option for the currency pair whose quote currency is affected by the data release. (Example: take the "call" option for EUR / USD after US NFP data reaches a worse-than-expected result). All option positions that can be opened are set to expiry time of 5 minutes. This is because in the period of 2 minutes the price has not shown a definite trend, whereas if the option position is placed on a trend that has been running for more than 5 minutes, the price has the potential to rebound. Therefore, expiry time over 5 minutes can be more risky on your option trading. In this case, 5 minutes is considered the ideal time for short-term traders to place their options in accordance with the results of the data that has been released. As long as the economic reports that are indicators of great impact, this method will almost certainly bring the 5 minute option you end up in-the-money. When the price fluctuates from a higher level than the MA to a position lower than the MA, the option chosen is "put"
When the price fluctuates from a lower position from the MA to a higher level than the MA, the option that should be placed is "call". In the chart of the above price movements, the 5-SMA is placed on the EUR / USD chart with the M5 time frame. The trading opportunity created by the above conditions is to place the option "put" when the candle is formed below the MA. Conversely, when the candle is formed above the MA, the option that should be chosen is "call". If both methods can be implemented properly for the above market conditions, the option trading will end in-the-money in just 5 minutes. If you take a trading opportunity from the SMA-5 into the option position that is opened every time there is a crossing on the MA line, then you will be able to profit continuously. Isn't this a very suitable strategy for short-term traders to make profits in a short time? Moreover, the magnitude of the chosen profit level does not affect the level of trading risk as long as the amount of capital used is not enlarged. Choosing an expiry time of 5 minutes does allow traders to make profits in a short time. In forex spot trading, chart observation at a low time frame is rather not recommended because of the large amount of "noise" that can generate false trading signals. 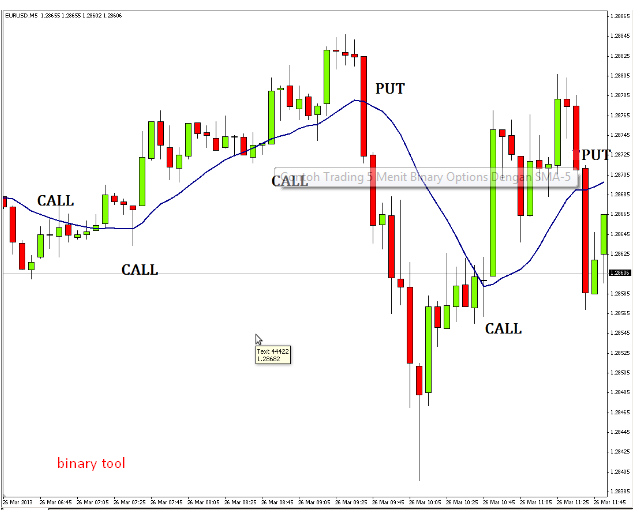 It is also one of the important points in trading binary options with this 5 minute strategy. To overcome this, you can apply the use of fundamental or technical analysis that can minimize errors in trading positions. 1. Practice first on a demo account. 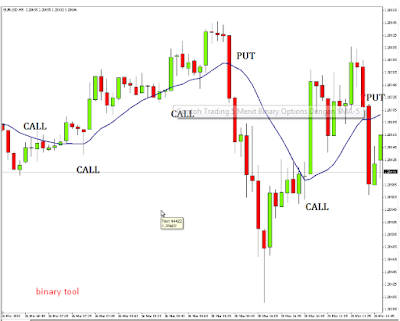 Although this 5-minute binary options strategy looks easy and profitable, not all traders can apply this method to their trading plans. Applying a strategy that suits your character and personality is one of the important factors that can bring success to trading binary options. If you feel comfortable with a trading strategy, the process that is carried out will feel easier and not burden trading psychology. Therefore, make sure you can maximize this strategy in the trading system that you are running. You can take advantage of the demo account facilities provided by binary options brokers. This method is a solution for those of you who want to test the accuracy and opportunities of this 5-minute trading strategy without jeopardizing the safety of your trading balance. 2. Keep running risk management in every opened trading position. It is common knowledge in the world of trading if there is no strategy that can produce a 100% probability to predict the next price movement. Therefore, the opportunity for loss should also be seriously considered so that traders can take into account the trading risks that can be borne. The use of a maximum of 10% of the amount of trading capital can be an anticipatory step if the trading position that applies the 5-minute strategy ends out-of-the-money. 3. Don't open the option position when the speech from the Central Bank leadership is in progress. At certain times, the leaders of the Central Bank will hold a speech to announce the latest policies, which usually will greatly affect the value of the currency. Therefore, it is better to avoid opening positions at this time, because speeches from the leaders of the Central Bank can be a momentum to drive price changes in a direction that is difficult to predict. 4. Avoid overtrade as well as possible. Even though binary options trading with 5 minutes expiry takes place in a fast period of time, it does not mean you are recommended to open positions immediately as soon as your trading ends. Both success and failure, it's good if you wait for the right momentum to re-enter the market. In this case, both utilizing fundamental news with a large impact and waiting for the formation of a candle below or above the MA line, can be a trading signal for placing new options. The binary options facility that offers short expiry time is one of the ease of trading that can be utilized by short-term traders. Here, option positions that only last in 5 minutes allow you to harvest profits in a short time. Money management settings and the risk of trading in binary options can also be done more simply, namely by determining the amount of capital and the level of profit you want to achieve. Thus, this method can be said to be a trading management method that is better than a forex spot, where you have to measure the percentage of capital and take a stop loss level to minimize losses that may arise.